Powers/Abilities: The Phantom Eagle was an ordinary human with expert stunt piloting and aerial combat skills. He was an exceptional hand-to-hand combat skills, with athletic reflexes. He flew a biplane (by some accounts a spad) of unspecified abilities, decorated with an eagle pattern atop its upper wings. As a ghost, his plane could fly through solid objects as desired. He presumably never needed to reload, etc. 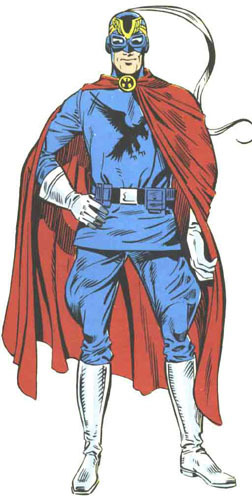 History: (Official Handbook of the Marvel Universe#14 - Phantom Eagle entry) - Karl Kaufman was the son of a pair of German immigrants, and grew up in the United States. At some point, his parents returned to Germany, but he remained in the USA. (Marvel Super-Heroes II#16 (fb) ) - Growing up, Karl had a rival with fellow teenager Rex Griffin, and both were attracted to Paula Jackson. After high school, Rex and Karl flew planes in a flying circus, but while showing off for Paula, Rex struck Karl's plane and crashed, badly injuring his leg. Rex was grounded, and eventually was engaged to Paula. Karl tested the Thomas Morse Scout plane for the US Air Corps, and was introduced to Major Jack Norris by Rex. Norris tried to enlist Karl as a flyer in the likely event that the USA become involved in World War I, but Karl was afraid that if he fought against Germany, his parents would be made to suffer. To conceal his fears, he claimed that the Air Corps couldn't offer him the money he wanted. In order to protect his family, Karl created the costumed identity of the Phantom Eagle so that he could take to the skies for the USA safely. Only his friend Curly shared his secret. (Thor Corps#3) <1916, September 7 - see comments> - While flying over Germany, the Phantom Eagle encountered a squad of late-20th century planes, hurled through time by the machinations of Demonstaff. (Marvel Super-Heroes II#16) <1917, March 5> - While on a test flight, the Phantom Eagle came upon a formation of German Fokkers, and managed to outfight them. He discovered that they had come from an enormous dirgible which had invaded the USA. Returning to Curly, he sent word to Rex at the nearest base, and Rex assembled a squad of fliers to intercept the dirgible, taking the cockpit of one of the planes himself. The Phantom Eagle was annoyed when he found Rex in the air, and took command of the US planes to attack the dirgible. Landing on the dirgible, he planted explosives and managed to fight past the Germans back to his plane and escape before the explosion. While fleeing, he noticed that Rex's plane was going to crash, and he threw Rex a rope from his plane. However, Rex cramped up due to his old injury and slipped from the rope, falling to his death. At Rex's funeral, Karl vowed that as the Phantom Eagle he would continue to oppose Germany until he had gained his revenge. (New Excalibur#12) - At some point during the war Phantom Eagle fought the Red Baron (Manfred von Richthofen). (Official Handbook of the Marvel Universe I#14: Phantom Eagle) - The Phantom Eagle engaged in many aerial battles. (Official Handbook of the Marvel Universe Deluxe Edition#19: Phantom Eagle) - Downing a remarkable number of German planes, the Phantom Eagle became known as perhaps the greatest aerial warrior of World War I. (Incredible Hulk II#135) - The Phantom Eagle was on a mission to destroy a giant German cannon when he encountered the time-tossed Hulk, who had been tricked by Kang into thinking that if he killed the Phantom Eagle, he could be rid of Bruce Banner. However, when the Hulk was struck by German bullets he turned on them, and wound up destroying the cannon. Before the Phantom Eagle could learn more about the Hulk, he was sent back to his own time. 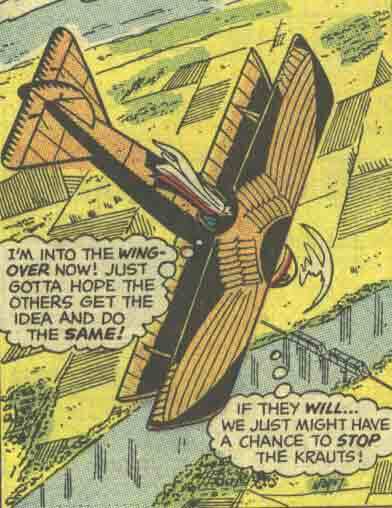 (Unlimited Access#2) - As Access (Axel Asher) was pulled across time/space, he glimpsed Phantom Eagle flying his biplane. (Skaar: King of the Savage Land#5 (fb) - BTS) - Phantom Eagle crashed in the Savage Land. After 40 days, he was rescued by a British team. The Antarctic German outpost was rooted out and the Eagle prepared to head home. Unable to take his broken ship with him, he left behind his journal with it as a curiosity for future explorers; he hoped his biplane would fly again. (Invaders I#7 (fb)) - In the latter days of the war, the Phantom Eagle joined a team of fellow costumed heroes called "Freedom's Five." His teammates included Union Jack, the Crimson Cavalier, Sir Steel and the Silver Squire. (Official Handbook of the Marvel Universe I#14: Phantom Eagle) - The Freedom's Five were instrumental in bringing about a number of significant victories for the Allies during World War I. (All-New Invaders#12 (fb) - BTS) - Freedom's Five had an adventure, where Sir Steel came at their opponents straight on, getting their attention and drawing their fire, while the others took their opponents by surprise from the flank. (All-New Invaders#12 (fb) - BTS) <October, 1917> - Phantom Eagle was absent during a Freedom's Five meeting regarding the threat of Ursula Frankenstein as he was overseeing maintenance on his plane. (All-New Invaders#12 (fb)) - Phantom Eagle returned in time to help Freedom's Five, aided by Iron Fist (Orson Randall), oppose an invasion of the Martian Masters including their tripod weapons. From his biplane, the Eagle slew a trio of Masters as they closed in on Union Jack and the Crimson Cavalier. Though surprised by the presence and appearance of the aliens, he then looped his biplane around to shot repeatedly the upper portion of one of the tripods -- and at the same time dodged the tripod's fire -- while the others took out its legs; the tripod shattered upon striking the ground. After a group of high-tech weaponry-wielding men under Eben Stafford arrived and attacked the remaining Martian Masters, the Masters vanished back to Mars, taking one of these high-tech warriors with him (I'm not sure whether this was supposed to be John Carter, or what...). (Invaders I#7 / Vampires: Marvel Undead: Baron Blood entry) - Freedom's Five was often on Baron Blood’s trail, but always a few steps behind; actual encounters proved rare, fleeting, and never when Union Jack was present, until 1918, when Blood was sent to London to slay senior British government and military leaders. (Ghost Rider II#12 (fb) - BTS) - The Phantom Eagle finally tried to get his parents out of Germany so he could oppose the kaiser openly and erase the blot on his honor. (Ghost Rider II#12 (fb)) - As Phantom Eagle led his parents to his plane, Hermann von Reitberger came upon the scene and shot the Phantom Eagle and his parents to death. The last thing the Phantom Eagle heard was von Reitberger's laughter. The Eagle's plane's fuel tanks exploded, leaving no trace of his plane or the three lives that had been extinguished. With no evidence of his death, there was no offical record of the Phantom Eagle's demise. (Ghost Rider II#12 (fb) - BTS / Official Handbook of the Marvel Universe Deluxe Edition#19: Phantom Eagle) ) - A week after the Phantom Eagle's death, piloting a ghostly biplane, the Phantom Eagle's ghost shot von Reitberger out of the sky. Von Reitberger survived, but was too frightened to fly again. (Ghost Rider II#12 (fb) - BTS) - The Phantom Eagle's ghost continued to pursue von Reitberger through two wars and three comments, into the modern day. Von Reitberger escaped the Phantom Eagle for years at a time and even married, but the Phantom Eagle always found him again. (Ghost Rider II#12) - In the modern day, when the Phantom Eagle shot at von Reitberger, causing him to crash his car in the Arizona desert, Ghost Rider (Johnny Blaze) came upon the scence, thinking von Reitberger the victim, and helped von Reitberger escape the plane's fire; Phantom Rider fired at the pair as Ghost Rider put von Reitberger on his motorcycle. After seeing Phantom Eagle fly his biplane through solid rock, Ghost Rider hid von Reitberger in a cave until Phantom Eagle flew off. Von Reitberger reinforced Blaze's belief by telling him a false tale of their past battle and the Phantom Eagle's death and telling Blaze he wanted to see his grandson one more time, after which he would give it up and finally face the Eagle. When the Phantom Eagle came for von Reitberger after he met up with his grandson, Johnny, he landed, and the Ghost Rider confronted the Eagle, who revealed the truth. 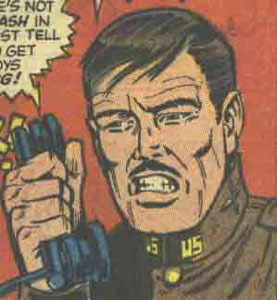 Even upon learning the truth, Ghost Rider argued that von Reitberger had been tortured for decades (see comments) and that was enough. Nonetheless, as von Reitberger took to the air, the Phantom Eagle went after him. Feeling von Reitberger's death was not a decision the Eagle had a right to make, Ghost Rider made a jump at his plane, but the Phantom Eagle turned his ship immaterial, and Ghost Rider passed through it. However, upon seeing that Ghost Rider might then fall to his doom, the Eagle flew back down, made his ship solid, and caught Ghost Rider on his wing in mid air. However, in doing so, the Eagle left himself vulnerable to von Reitberger, and he couldn't turn immaterial or Ghost Rider would fall to seeming death. As von Reitberger fired, Phantom Eagle dodged and then led von Reitberger through aerial maneuvers that the aged German could not match. Von Reitberger crashed into his grandson's hangar and died. With von Reitberger gone, the Phantom Eagle's ghost flew off in the biplane towards the moon. Ghost Rider noted that the Eagle could go to his final rest, but hoped he had bad dreams. (Ghost Rider II#13) - The Phantom Eagle's ghost continued to fly off in his biplane towards the shimmering moon, never too be seen again. (Skaar: King of the Savage Land#5 (fb) - BTS) - Phantom Eagle's ship and journal were found by a "strange mountain man" who claimed/seemed to be periodically entered by the original Phantom Eagle's spirit. The ship was repaired and the man wore a uniform patterned after the Phantom Eagle's. (Skaar: King of the Savage Land#5 (fb) - BTS) - After Ka-Zar collapsed atop a frozen mountain after slaying a pteranodon, the man allegedly channeling the Phantom Eagle and several others found him. (Skaar: King of the Savage Land#5 (fb) - BTS) - The man read to Ka-Zar from the Phantom Eagle's journal, telling him how he had gained the biplane, etc. After the others proclaimed that the spirit of the Phantom Eagle had entered him again, this Eagle offered Ka-Zar his wings "and this land's enemies death from above." Ka-Zar told him it would take more than an old plane to win, but the Eagle assured him they had much more than one plane. (Skaar: King of the Savage Land#4 - BTS) - Flying the biplane, this Phantom Eagle joined Ka-Zar and other pteranodon-riding troops against the Designer (who was possessing Shanna and had usurped Ka-Zar's rule of the Savage Land) and his forces. (Skaar: King of the Savage Land#5 - BTS) - This Phantom Eagle continued this fight. When Ka-Zar's pteranodon was wounded and began to descend, this Phantom Eagle flew down and caught Ka-Zar on his wing. Soon after, the Designer revived Umbu the Unliving, and when this Phantom Eagle approached Umbu, the robot struck the biplane with its hand. As the biplane descended with fire streaming from its tail, Ka-Zar leapt off. After Skaar stopped Umbu, this Phantom Eagle was amongst those who chanted for Skaar, who was proclaimed the new king of the Savage Land. Comments: Created by Gary Friedrich and Herb Trimpe. Ghost Rider II#12 identified Karl Kaufman as a German-born American, but the Official Handbook of the Marvel Universe#14 identified him as an American of German descent. Considering that his parents were living in Germany in World War I, it makes better sense for him to be German-born. Also, where'd the OHOTMU get that "brown" hair from? 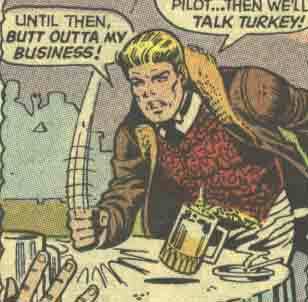 As you can see, he's clearly blond in Marvel Super-Heroes II#16. The date for the Phantom Eagle's adventure in Thor Corps#3 doesn't quite work -- Kaufman was still based in the USA in his 1917 adventure in his first appearance. He wasn't supposed to be fighting overseas until after the USA entered WWI (April 6, 1917). Friedrich's setup in Marvel Super-Heroes II#16 reminds me a lot of Marvel's western heroes. If it had successfully launched a series, I expect it would have been a bit like the Two-Gun Kid or Ghost Rider, with Curly in the Boom-Boom Brown/Jaime Jacobs role, Paula as a Nancy Carter/Natalie Brooks, etc. Examine the images below...then, keeping in mind how late in Trimpe's career he took on aspects of Rob Liefeld's style, tell me if you think Liefeld got his infamous gritted teeth from Trimpe. 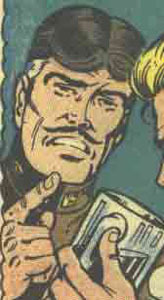 In Ghost Rider II#12, it is noted that it had been 60 years since Kaufmann's death. That was true in 1975 (OK, it was 57, not 60), but it's been another 40 years since that story. 60 years is a topical reference, but having von Reitberger be like 125 years old, assuming he was only 25 when he slew Kaufmann and his parents, is also problematic. Perhaps' Kaufmann's ghost somehow/subconsciously/magically kept von Reitberge from dying of old age until he could gain his vengeance in combat. Von Reitberger reported this account of the Phantom Eagle's demise. This is a lie in Reality-616...but is true in Reality-75612, it is true...The Phantom Eagle's ghost challenged von Reitberger to an aerial duel, and von Reitberger accepted. He succeeding in shooting the Phantom Eagle down, and witnessed his "death" amidst the ruins of his plane. Before "dying," the Phantom Eagle vowed that he would have revenge upon von Reitberger. In all three of the 20th century Handbook series (original, Deluxe, Master), it's Kaufman (no extra 'f's or 'n's). The Ennis version (Reality-200111) spells it Kaufmann, just like the very first reference to him. 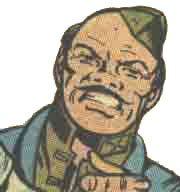 Curly Anderson was Karl Kaufman's assistant in his identity of the Phantom Eagle. Curly performed all of the mechanical work on the Phantom Eagle's planes. He kept a journal which contained all of his friend's secrets, and it was eventually obtained in modern times by Joel von Reitberger, grandson of Hermann von Reitberger. Rex Griffin was Karl Kaufman's friend, although as teenagers they sometimes fought each other for the affections of Paula Jackson. As adults, Rex and Karl flew together in a flying circus, but while showing off for Paula Rex hit Karl's plane and crashed. Suffering a bad leg injury, Rex was grounded from flying. This brought him closer to Paula, and they eventually became engaged. Rex went to work behind a desk for the Air Corps under Major Jack Norris, and tried to get the major to recruit Karl, to no avail. When the Karl alerted Rex to the invasion fleet led by General Heinrich von Ronstadt, Rex took command of a squadron, despite his injury. The Phantom Eagle destroyed the dirgible, but Rex's plane was damaged. The Phantom Eagle threw him a rope to bring him aboard his plane, but Rex cramped up from his injury and slipped, falling to death. At Rex's funeral, Karl vowed that he would have his revenge upon Germany. Jack Norris was an officer in the Air Corps who attempted to enlist Karl Kaufman as a combat pilot, but was refused because Kaufman wanted to protect his family. He also served as Rex Griffin's superior, and attended Rex's funeral. Paula Jackson was beloved by both Rex Griffin and Karl Kaufman, and the two would sometimes fight each other for the honor of taking her to a dance. When Rex was grounded from flight, he and Paula became engaged, even as he joined the Air Corps behind a desk. Paula saw Rex off as he went into combat against the forces of General Heinrich von Ronstadt. After Rex's death, she attended his funeral.